Our company sold more than 10,000 F Series inversion tables. These include the F5000, F5000III, F5000 Sport, F7000, F7000S. These were and are excellent tables. However, they have been improrved upon and the Teeter EP-950 is the top of the line manual inversion table and has many features that make it a much better choice than the F7000S™ Inversion Table. 1. Over EZ Handles: Larger padded support handles assist during inversion and ascent. Ratchet Ankle Lock System: The extended handle for the ankle lock system provides an easy-to-reach solution in addition to its triple lock security feature. On the F7000S you need to reach down near your shoe laces, on the EP-950 Inversion Table you only reach donw near your knees. Ratchet Ankle Lock System: This lock has finer adjustment increments so you can find a more comfortable setting for your ankles. The EP-550 has 1/2 inch adjustment settings the EP-950 has 1/4 inch adjustment settings. Pre-set Rotation Control: The EZ AngleTM Tether Strap is a unique feature that allows preset angles at 20, 40 or 60 degrees and provides an easy guide to where the benefits of inversion begin and are fully realized. 6. Oversized Medical Grade Frame - The strongest, heaviest manual table frame Teeter currently makes. Injection Molded Fex Technology Bed - Designed to conform to your back which assures the ultimate in comfortable inversion. This is a major imporvement over the canvas on the F7000S. The canvas will stain with hair oil. The canvas will sag over time and require repeated tightening. The canvas can tear. Our company receiveds calls regularly from people with the F5000, F7000 and F7000S needing a replacement canvas. 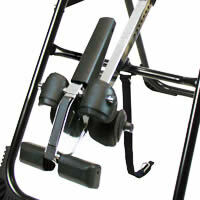 The 6 Special features makes the EP-950 the the most popular and best selling Teeter Inversion Table. If you would like to own this model and your budget is tight please take a look at our Payment Plans. If your budget is tight please see our payment plans. Teeter Hang Ups inversion tables are the best selling inversion tables in the world. They are the best quality, easiest to assemble and have the best warranty. Teeter Hang Ups inversion tables allow you a full range of motion and to hang at all angles of incline including total inversion locking for inverted exercises - sit-ups, inverted crunches, inverted squats and other inverted exercises. The EP-950 includes the Ratchet Ankle Lock System. The extended handle for the ankle lock system provides an easy-to-reach solution in addition to its triple lock security feature. EZ Stretch Traction Handles: With the muscles in your lower back relaxed, pushing on the handles can help to increase traction and enhance your stretching experience. The handles can also be used as a tool for intermittent traction and oscillation. Standard on the EP-950 - a $39.00 accessory on the EP-550. Whether you want to enjoy better posture, reduce back pain, or simply minimize your daily stress load, the Teeter Hang Ups EP-550 inversion therapy table makes a terrific choice. 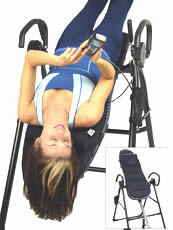 Inversion therapy works by placing your body in line with the downward force of gravity. In the process, inversion elongates the spine, increases the space between the vertebrae, and relieves the pressure on discs, ligaments, and nerve roots. And less pressure means less back pain, as well as fewer headaches and neck problems. Inversion is an ideal therapy for people with persistent spine and muscle problems, in addition to athletes who frequently push their body out of whack through repetitive muscle motions, such as runners, weightlifters, skiers, bikers, and golfers. Studies suggest that inverting yourself a mere 20 degrees for even a few minutes per day can have tremendously positive effects. We find if you are trying to decompress a seriously compressed disc, degenerated disc, desiccated disc, herniated or ruptured disc then 15-25 minutes twice a day is a good program. One time in the morning and one time in the evening. Pelvic stabilization exercises may also be important. The EP-950 is outfitted with such features as Flex Technology, which allows the backrest to bend accommodate your stretches for greater mobility and range of motion; an adjustable foot platform with two settings, allowing you to find the optimum position for ankle comfort and security; and an EZ Angle tether strap, which offers preset angles at 20, 40, and 60 degrees, along with custom angles depending on your preferred position. Other details include an adjustable head pillow for maximum comfort, an instructional DVD, and a 300-pound user capacity. The EP-950, which accommodates people as tall as 6 feet 6 inches, carries a five-year warranty. An excellent feature of the EP-950 are the EZ-Stretch Traction Handles, which provide added benefit to inverted stretching and decompression. The handles make it possible to achieve the equivalent of a fully inverted stretch even while at lesser angles. In addition, they can be used as a tool for rhythmic intermittent traction and oscillation - The Rocking Motion. 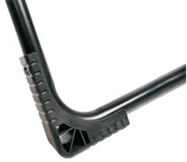 The Easy-Reach-Handle allows you to lock yourself in and unlock by only reaching down to knee level. If you are interested in the best, easiest to use and most elegant inversion tables, please see the Power II and Power VI inversion tables. If you have a question about a table you do not see on our site please contact us. *Denotes features unique or patented for Teeter Hang Ups equipment. Secure the table bed to the A-frame for improved security. Teflon embedded epoxy coated roller bearings. Guaranteed smooth rotation with no squeaks for the life of the table. Patented cam locks for security. Added strength and durability in key structural components. Strongest in the industry. Reduces shaft movement to allow for quiet, shift-free rotation - the only design on the market to structurally engage the main shaft. Steel wall thickness at least 20% greater than any main shaft on the market. Features embossed height markers in both inches and centimeters for easy adjustment. Package - 49" x 29" x 8 1/2"
Covers all components. Best warranty in the inversion industry. Designed to conform to your back which assures the ultimate in comfortable inversion.. Allows you to preset the tether strap for worry-free inversion to any angle. The unique design allows for greater comfort and security while inverted. Added benefit for increased spinal decompression and oscillation. 85% pre-assembled with less than 1/4 the parts of other inversion tables. The DVD walks you through a simple assembly. Easy adjust for different size feet. The Easy-Reach-Handle allows you to lock yourself in and unlock without having to reach down too far. If you have difficulty reaching down to tie your shoes the EP-950 may be a good choice for you. State of the art triple lock security. These adds stability to an already very stable table. They increase the A-frame base by 20%, help to prevent sliding and protect floors. Offers preset angles to 20, 40 and 60 degrees. This make it easy to gradually increase the angle of inversion without over stretching. Remove strap to go 90°. One reason the EZ Stretch Traction Handles are a very good idea is that they make doing the oscillation - The Rocking Motion - Rhythmic Intermittent Traction very easy. Simply lay down flat on the table and when you want to rock up pull on the handles bend your knees and you will come up. The handles also make it possible to achieve the equivalent of a fully inverted stretch even while at lesser angles. The EZ Stretch Traction Handles are at the perfect position with your arms straight to be able to utilize the strongest upper body muscles to aid in your decompression therapy. Once you have used your table for a while your back will be relaxed and stretched out enough that you can add enough height by just pushing on the EZ Stretch Traction Handles to change your weight distribution on the inversion table to tilt backwards and create the rocking motion. Using the same muscles that a parallel bar gymnast uses you can elongate the spine and this stretch can create space so the disc can re-hydrate and the rocking motion will create a pumping action to stimulate circulation and regeneration of the discs. This is the theory and is seems to work in practice in a very high percentage of degenerative disc, herniated disc and ruptured situations. Testimonial - "I love my Massage Mat. It vibrates the stress and pain out of my body." C.J. Your inversion table will ship out very quickly. Usually within 24-48 hours of purchase. We ship UPS ground from several warehouses throughout the U.S. Your table will ship from the warehouse closest to you. Delivery is usually from two to five business days. Every effort is made to expedite your order. Once it ships you will receive an email which includes the tracking information. We pay all necessary sales tax for you. inversion tables, refurbished inversion tables, damaged inversion tables or cosmetic defect inversion tables. With your inversion table you will receive a FREE educational DVD, a laminated Owner’s Manual Your inversion table will ship FREE to the lower 48 states, and come with a FREE five year factory warranty. Regular price for the EP-950 is $459.95 plus shipping and handling. Our price is $399.00 - total price to your door. No hidden costs. We advertise and sell Teeter Hang Ups Inversion Tables at the lowest allowable price. Our customer service is excellent and we have tens of thousands of satisfied customers. Most people purchase the Teeter Hang Ups EP-950 Inversion Table because it is an easy and convenient system for getting locked in and unlocked. And has many useful features. 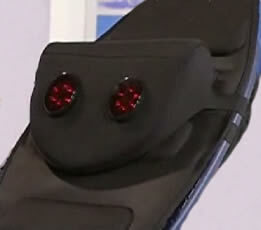 The gravity boots are most often used for athletic purposes such as upside down sit-ups. Those purchasing the EP-950 in most cases would never have a need for gravity boots. As with the other tables you do not need gravity boots to do sit-ups and other exercises. However, for some who want to do extensive inversion in the fully inverted position, boots may be necessary for maximum comfort. Please concact us for a quote. nylon travel bag, making transportation and storage easy! specifically oriented towards exercises or using a table.